Stress comes in many forms and fashions. From your basic acute stress of a surprising deadline change. To the chronic stress created by an irregular sleep pattern or challenging relationships. Sometimes all it has taken me is a couple of deep breaths or a CNS Reboot session to get back into a good mental and physical space. Other times it has taken a major lifestyle overhaul to address the stress that was filling my life. I have witnessed many of these benefits in my clients lives and experienced them myself. These benefits are not relegated only for the mystics amongst us or those hiding in retreat. They are available to anyone who has a DESIRE to CHANGE. And makes the decision to manage their stress instead of reacting to it. My client Jim* is a great example of what this decision can lead to. His life went from a frazzled state of burnout and low productivity to finding new hope, energy, and drive. 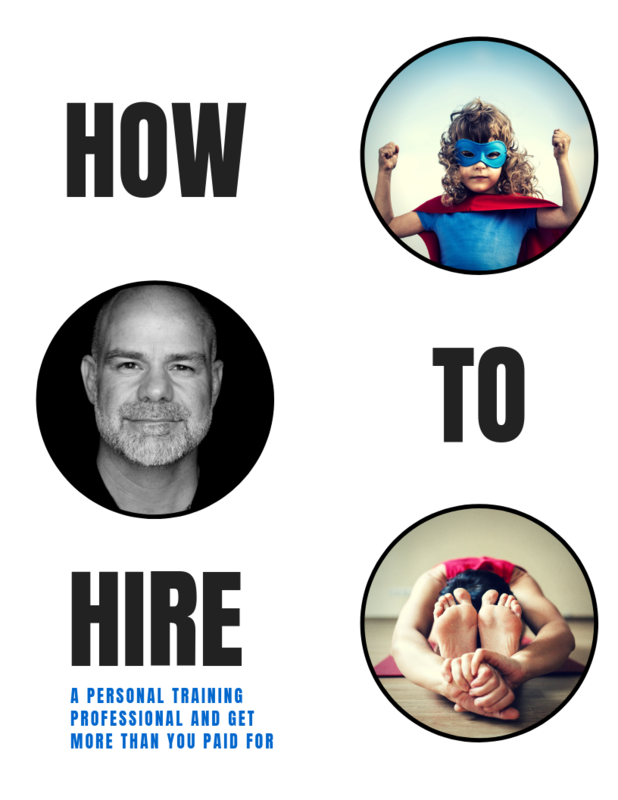 Jim came to me feeling captive to an ever demanding small business and family responsibilities. The business had him traveling weekly with all the stresses of being an owner operator. Multiple family and community commitments sucked up any remaining energy. In short, stressed out and on the verge of a major burn out, he came to me with a strong desire to change and we got to work. 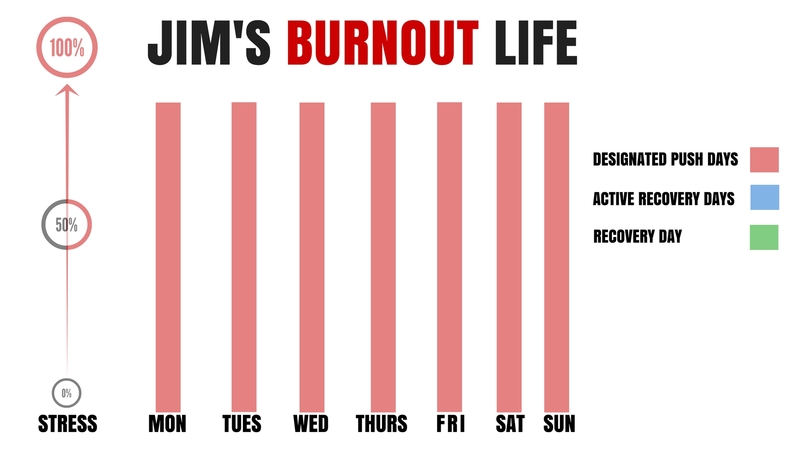 His reboot began by doing a weekly and yearly overview of his activities and commitments. 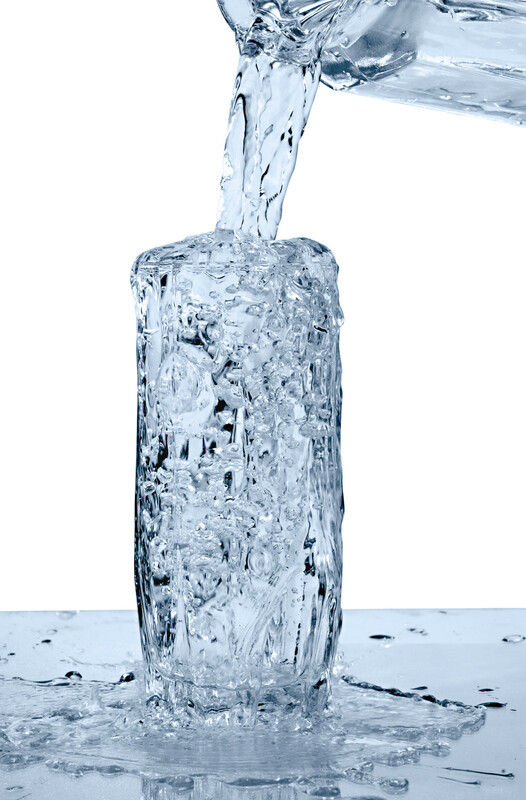 I asked him if he poured 2 gallons of water into a drinking glass could he expect it to all fit? He replied with the obvious answer, "No". I reminded him that we all only have 24hrs in each day and 52 weeks in a year. 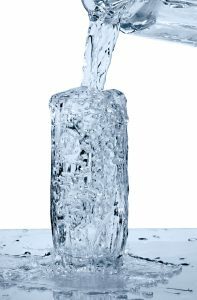 If his goal was to create a stress-less lifestyle, adding more to an overflowing glass would be counter-productive. He had to prioritize and realize that saying, "No" to something of less importance was saying, "Yes" to the things he prioritized. He had to create some space to breath in his life. I am all for dreaming big and pushing limits. But as A.L. Williams said, "All you can do is all you can do, but all you can do is enough." Creating a vision of your life with mindfully created expectations is essential. It is not about limiting your expectations. I want you to DREAM BIG! It's about realizing you have 24hrs and 52 weeks. You can't do it all. But you can do a few things extremely well. What's really important to you? You have to begin saying, "No" so that you have the space to say "Yes". If you want to create a new rhythm and flow to your life you have to make room for it, not try cramming more into it. 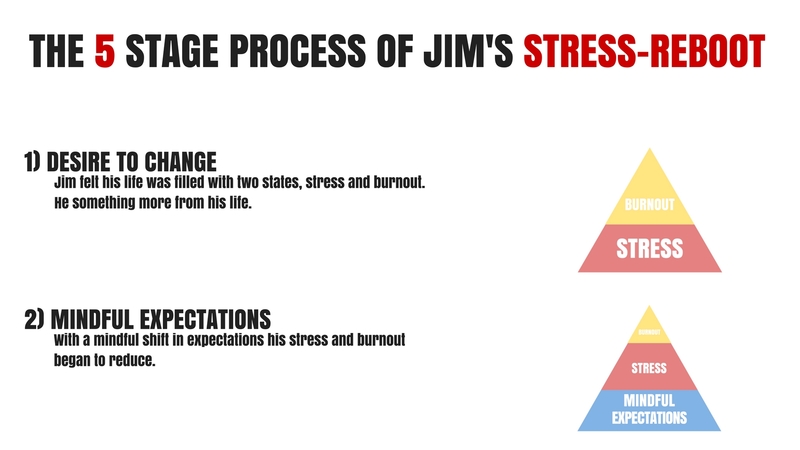 First, we identified Jim's current daily stress level on an average week. Next, we identified Jim's vacation and down times over the course of a year. 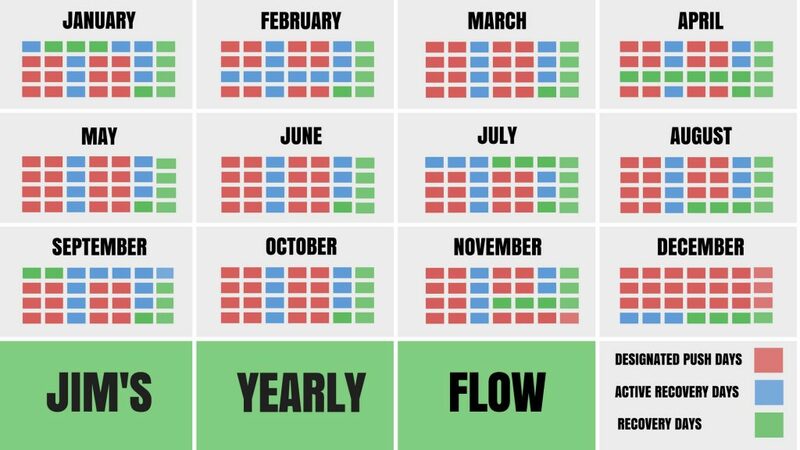 Finally, we put together an IDEAL weekly work flow and a yearly template. 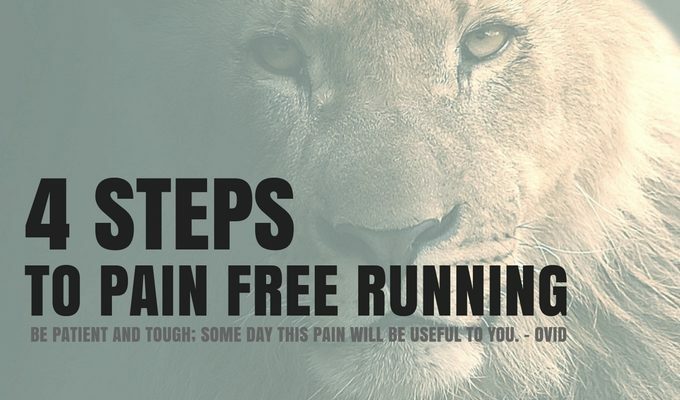 Push Days - feel free to push it hard mentally and physically. Active Recovery Days - you do what you have to for work, but any extra activities are done at a submax intensity. Any exercise is done to destress. You are actively looking to do things that help you replenish mentally, physically, and emotionally. Recovery Days - sit, do nothing, take a nap, get a massage, read a book for pleasure, watch a movie with the kids. When Jim took the time to evaluate his life from 10,000 feet he saw how unrealistic it all was. The idea of mindful expectations became very clear to him then. Jim's Thriving Flow templates gave him the freedom to push as hard as he wanted during designated times, without worrying that he was heading for burnout. They also helped him embrace his down times as needed and productive. Did he keep to the weekly and yearly schedule perfectly? Not even close! And you shouldn't expect to either. The goal isn't to add more stress to your life by making you stress about keeping to a schedule. The value of the templates for you should be the same as it was for Jim. They allow you to prioritize what you want and how it is going to fit into your life. And most importantly they act as beacons of clarity and refuge. When the 100% stress days start piling up and your weekly schedule flies out the window, you can use your templates and Practice of The Day to guide you back to a stress-less life. After doing a CNS Reboot session with Jim I talked to him about being proactive in turning the fight-or-flight response on and off. Jim was like many people that I see was stuck in a constant state of tension because his body was always on alert. 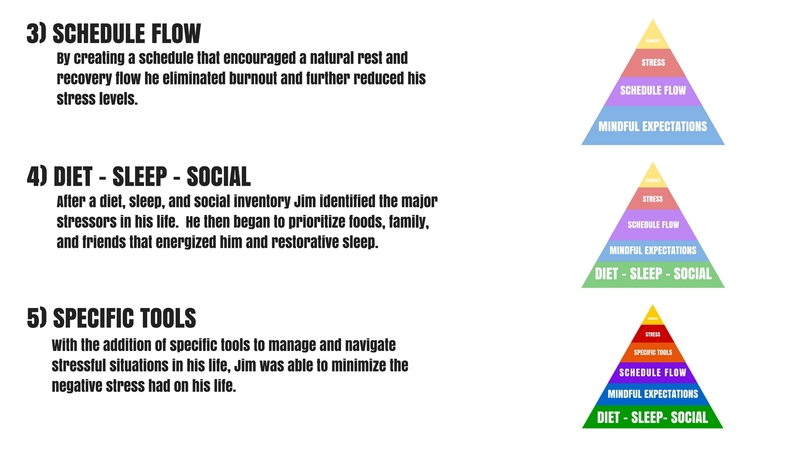 We did a diet, sleep, and social inventory to identify his regular stressors. Then I introduced two powerful daily stress reduction techniques. The first was breath work. The second was mindfulness meditation. Together they created what we called his Practice Of the Day (POD). His POD became his personal reset and refocus button. Jim did not become a mediation guru and vegan, who only hung out with nice people and slept 10hrs a day. He still had cocktails with clients and started his day with an espresso, but he become aware of the effects each had on his blood sugar and adrenal glands. He still had nights that were short on sleep, but he now had tools like a short yoga nidra session that kept him refreshed and focused during the day. He became aware of the interplay between his diet and sleep in a way that allowed him to use them as real time meters of his true stress levels. If he had trouble focusing, was craving sugar and extra caffeine, he knew catching up on sleep was a needed priority. He created a shortlist of people he could use as a sounding board to verbalize frustrations and brainstorm ideas with. Jim also had a shortlist of "toxic" people is his life he had to deal with for professional or personal reasons. We created strategies for dealing with these people and he made it a point to interact with them only when he had the mental and physical resources to do so. By managing his schedule and environment in a proactive way, arming himself with new insights, goals, and tools, his overall stress levels began to plummet. Creating the space he needed to allow his general performance and life enjoyment to skyrocket. Then came the details. Stress comes in many forms, from the high energy intensity of getting into an argument, to the dull exhaustion of go, go, go. Sometimes we would do anything to shut off our minds and the ideas racing through it. Other times we would give all we had for just one idea. Different types of stresses require different tools to help recalibrate us back to our optimal state. During our weekly training sessions Jim would come to me in a variety of physical and mental states. Based on his energy levels and schedule we used his sessions to distress, re-energize, and refocus. One day he might come in fired up and frustrated by an altercation with an employee. So we took to a high intensity boxing workout that burned through the frustration. Then we refocused with some breath work and stretching. With each session we filled his personal tool bag with specific techniques and workouts so he could reboot on his own. On the road, exhausted from too many plane trips and not enough sleep, Jim began using tempo cardio workouts and a series of lower back release techniques in his hotel room to get his mind and body back where it needed to be. He began using red lights and checkout lines as reminders to check his breathing and stress level. He continues to play with evening rituals to maximize what sleep he does get and simplifying his morning routine. 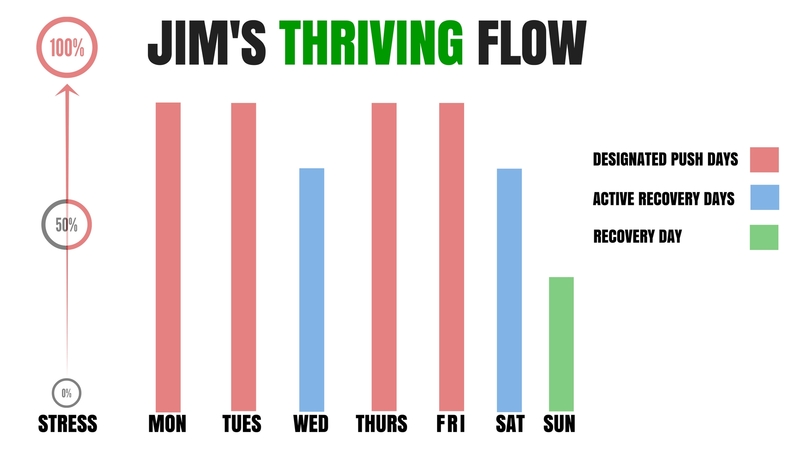 manage your weekly flow by starting to say "No"
You don't need to overhaul your life. Start with small adjustments. Enjoy the small increases in performance. As you systematically make more space for the new rhythm and flow that is your life. *Jim’s name has been changed and is a composite of a typical midlife professional or parent I commonly work with.